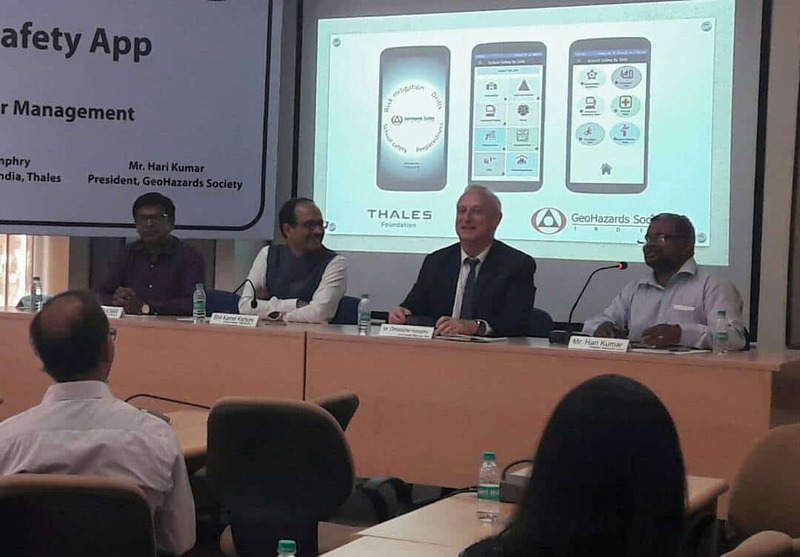 Thales Foundation and GeoHazards Society (GHS) announced the nationwide launch of a first-of-its-kind School Safety Mobile Application that will allow school administrators to ‘write’ a School Disaster Management Plan (SDMP). The Android-based app was launched by Mr Kamal Kishore, Member, National Disaster Management Authority (NDMA), Prof Santosh Kumar, Executive Director, National Institute of Disaster Management (NIDM), and Mr Christophe Humphry, Chief Operating Officer, Thales in India, and Mr Hari Kumar, President, GeoHazards Society, at NIDM headquarter in New Delhi. The pilot testing of the application took place in schools in Dharamshala in Himachal Pradesh, Patna in Bihar and Aizwal in Mizoram before the formal launch. This mobile application has been developed as part of the project undertaken by GHS with the support from the Thales Foundation – an initiative that aims to draw on Thales’s innovative flair and technological expertise to benefit society in the areas of education and humanitarian crises. The project led by GHS and Ms Charu Pandey – an employee volunteer from Thales in India – started in July 2016. It focused on various aspects of school safety in Himachal Pradesh’s Kangra district – one of the high risk and hazard prone regions of the country. GHS conducted staff preparedness training programmes, students training programmes, developed school disaster preparedness plans and tested these plans with preparedness drills. A large number of school administrators, teachers and students were mobilised through this project. The app has various modules including school profile, hazard profile of the school, falling hazards identification, formation of disaster management teams among others, with the user having a brief guidance on how to use each module to enter the required data. Once the data capture is complete, the user can generate and share the disaster preparedness plan with multiple users as a PDF file via email, Bluetooth, Whatsapp etc.